I understand that all suffering comes from desire, and am trying to work with this - but it contradicts the fact that I have a desire to improve myself as a person and live a better life - but if I have this desire, how can I end my suffering, as I still have desire!!?? Please help. I am currently taking this journey alone, and not sure where to go to find others who can help me. talgar123456 wrote: I understand that all suffering comes from desire, and am trying to work with this - but it contradicts the fact that I have a desire to improve myself as a person and live a better life - but if I have this desire, how can I end my suffering, as I still have desire!!?? who will listen, but not in a forceful manner. Not all desire's lead to suffering, desire's based on greed hatred & delusion do. But desires based on wholesome states, leading to the development of generosity, renunciation, good will, the noble eightfold path, the seven factors of awakening, should be encouraged. The seven factors of awakening are the kammas that uproot greed, hatred & delusion. 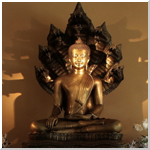 Even the buddha after his awakening desired to help people, and so he established his fourfold spiritual community. Here's a great sutta that addresses your concern.. I think part of the problem is that people tend to conflate desire (chanda) and craving (tahna), and this is partially the fault of translators, but desire and craving are actually two different but closely related aspects of our psychology. Desire is a neutral term, and one generally has to have the desire to achieve a goal in order to achieve it, even nibbana (SN 51.15); whereas the Pali word for craving, tahna (literally 'thirst'), is something that's directly tied to suffering. He goes on to explain that, "This passage shows that the problem lies not in the desire, effort, intent or discrimination, but in the fact that these qualities can be unskillfully applied or improperly tuned to their task." So, essentially, desire can be beneficial in certain contexts, and you shouldn't worry too much about the desire to do skillful things. In my opinion, it is not skillful to think or intellectualize about where suffering comes from. Only through meditation can we gain insight into how we cause ourselves to suffer.
" Don’t think. See." - Bhante Gunaratana. Just to add to what others have said - a lot of confusion arises among Buddhists (both new and not so new) over terminology like "desire", "mindfulness", etc. In my experience a lot of this confusion is because of how certain technical Buddhist words in Pali or Sanskrit have been translated into other languages, often using very conventional words. The case of "desire" here is a perfect example; the English "desire" doesn't differentiate between tanha and chanda. When in doubt about something like this, it can oftentimes be very....enlightening to go and check out what words are being used in the original texts and the nuances of those words. What might seem like a logical paradox is very often just linguistic confusion arising from translation. Yes the desire for understandment of reality is very good , also so is the desire to be happy/ stop suffering and to make other people be happy/stop their suffering. Say you have a strong desire (addiction or craving ) for alcohol consumption. Say your drinking habits lead you in to financial distress, problems with social family and job related problems. So you now desire not to desire alcohol and successful with it. Now you are a happy person. Now you end the suffering from financial distress, problems with social, family and job related problems. Buddhist have the desire to attain Nirvana. But there is no place called Nirvana, There is no person to attain it, there is nothing to be attained!!!!! Your question is a very good question. Please read attached from chapter 15 onwards.